We announce some future subscription changes to prepare you in advance. At DLF, our community is central to everything we do. As such, proactively and transparently communicating to you is one of our core tenets. After all, without you, DLF does not exist. When DLF was launched in 2006, we did so with the dream of creating the largest and most knowledgeable football community on the planet and have done just that. When we launched our Premium product in 2012, we did so with a commitment to offering the best content written by the best players and writers across the dynasty landscape, but at a price level most could rationalize and afford. To further add to our value proposition, we continue to develop new tools and methods for delivering the dynasty information you need to have to positively impact, not only your fantasy results, but also your enjoyment of this great game. While we have resisted price changes in the past, the increasing costs of doing business, paying our writers and contributors for their work, maintaining the site to our expectations and developing more and more resources for you has reached a point where this change is much needed. Beginning on 1/1/19, the price for our annual Premium membership will increase to $39.99. Additionally, the price for a NEW monthly membership will rise to $7.99. Existing monthly/recurring subscribers will see no increase to the $4.99/mo. pricing as long as the membership remains active. This means any subscription purchased between now and the end of the year will be at the current price point and will simply add on to the end of your subscription if you’re already a current subscriber. In other words, you won’t pay the new price until your subscription is up for renewal in 2019 or beyond. We are communicating with you ahead of this increase to provide as much notice and flexibility as possible. Whether to ask questions or plan for your membership in 2019, we understand the communication to you is important. If you’ve been a member of DLF in the past, you also know we routinely provide special offers throughout the year to help lower membership cost and that’s where you need to keep reading. While we can’t promise to hold specific discount events in the future, we have yet to miss a Black Friday/Cyber Monday promotion, which tends to be our most aggressive discount each year and allows new AND existing members an opportunity for a reduced cost. Letting you know about this necessary change in cost now instead of later enables everyone to prepare for what is our largest sale of the year. We publish approximately 1,000 articles per year, meaning the new price will only be roughly four cents per article instead of three cents, but we still don’t want to trivialize $10 a year or 83 cents per month. For some of you, it’s a material amount that could be the difference between supporting DLF via a Premium subscription, or not. It is through the promotional events that we hope you can continue to support what we’re doing here if that makes a difference in your wallet. Again, we didn’t want to surprise any of you since we value each and every member. Whether through a planned promotional event or our offer of a free DLF Premium subscription with any $10 deposit as a new DraftKings customer, we hope you continue to support what we’re doing here. Anyone who has been a part of our community understands the level of commitment we have to each of you, Premium subscriber or forum member, hopefully both. We like to say there exists no other fantasy site which interacts with their community quite like we do and we take great pride in that. We couldn’t be more pleased with how this community continues to evolve and grow and each one of you is responsible for making DLF what it is today, we’re just happy to provide that sandbox. Know, too, we also understand that should we ever choose to take our community for granted, that is when you may choose to spend your time somewhere else. We don’t want that to happen so we continue to engage with you in hopes you will continue to engage with us. It’s really that simple. Thank you again for being such a large part of what DLF is today, we cannot thank you enough for your continued support, enthusiasm and passion. We truly hope you feel a difference being part of our community and that you’ll continue to call DLF home for many years to come! Q: How long are your annual subscriptions good for? Are they based on the NFL season or a full year of access? A: Our annual DLF Premium subscriptions are for 365 days, so no matter when you sign up, you have a full year of access. Q: I have a current subscription that expires at some point in 2019. Can I still take advantage of the current pricing? A: Yes! You can always purchase additional annual subscriptions and they’ll simply add on to your current expiration date. For example, if you subscription expires on 4/28/19 and you purchase another subscription today, your account will be extended through 4/28/20. Q: I currently have a recurring monthly subscription for $4.99. After 1/1/19, will I be charged the new price of $7.99/month? A: No, as long as your current recurring subscription is not canceled, you’ll remain on the recurring plan you originally signed up for, at the same price point. The recurring monthly subscription will simply renew automatically as long as the payment information is valid. Q: I purchased an annual recurring subscription a couple of years ago when you offered that as a product. What happens when the current subscription expires? Does my current price go away? A: As long as your current recurring subscription is not canceled, you’ll remain on the recurring plan you originally signed up for, at the same price point. The recurring annual subscription will simply renew automatically as long as the payment information is valid. Q: Can I sign up for a recurring annual subscription to lock in my rate? A: Unfortunately, we stopped offering the annual plan as a recurring subscription a couple of years ago. However, we have grandfathered in those subscribers who still have an active account with that plan. Q: How many annual subscriptions can I purchase? How does it work if I want to make sure I have the current pricing for the next few years? A: You are able to purchase as many annual subscriptions as you’d like. They will stack on top of each other, 365 days for each one. Q: How can I make sure I don’t miss an announcement about any promotional sales event? A: We will make sure information is posted on our website, twitter, and via our weekly newsletter. Best deal in the industry. Thanks Ryan, we appreciate that! We hate having to raise our subscription cost and have held off on doing it for a while now, but at some point we have to in order to continue growing and making the site better for everyone. Thanks Ryan! That means a ton to us. We pay our writers and contributors to make sure we exceed those very expectations. As the community grows, expenses certainly grow with it. We try to keep things at a price point that seems realistic to what we can provide now with room to provide more in the future. The site is a labor of love for me personally. In a lot of respects, I’ve missed a lot of my kids events growing up and lots of other activities to pour my heart into DLF. We all have so much passion for this and appreciate all of you so much. We realize this is still a bargain in comparison to a lot of other sites, but this change isn’t about us making a boatload of money – it’s about sustaining what we have and building it forward. Any word on a DLF app? DLF > Fantasy Pros all day. Can’t wait to tack on another year of membership while the stove is hot! TL – Thank you so much for the support and your patronage. Nothing is more important to us. It’s the last thing we want to do but as Ken Kelly said above, it’s a labor of love and we have expectations for our level of content, service, infrastructure etc. and the inflation all around us is forcing our hand(s). But we know we have the best community on the planet and we don’t take a single one of you for granted. So the least we can do is communicate well in advance to our community, continue to ask for your support and then follow through with a level of performance you all have come to expect from us. Hi TL, thanks for asking about that. It is on our development radar. There are honestly a couple of other priority items we plan to address before looking at developing an app, so no ETA as of yet. But hang in there and thank you for letting us know it’s something of interest to you, that definitely helps. No one ever wants to pay more for something, but this one is well worth it. And we certainly don’t like raising our price. There is no money-grab here at DLF, that’s for sure. So much of the income goes back into our writers, content creation, development/tools, hosting and just keeping the lights on. Inflation has been occurring all around us for the last few years and we’ve kept holding off raising our prices because we want DLF in EVERY home, available to every dynasty player. And $10 to some is VERY material so we don’t trivialize that. Thanks so much for your support Jason, we’ve got the best community on the planet. We accept all feedback Joel and appreciate the response. I can whole-heartedly say we don’t “regurgitate” known FF principles though if you’ve been with us a long time, sometimes it may feel that way. We also have new dynasty players that need that info. We’re also a team looking for new ways to bring you fantasy information and the channels to help you do better with your own research, but we’re also constantly digging for the new/young players that others haven’t discovered yet and looking at new opportunities to use analytical tools and trends to better your results. We will continue to focus on strengthening our value proposition as well, that’s a promise. 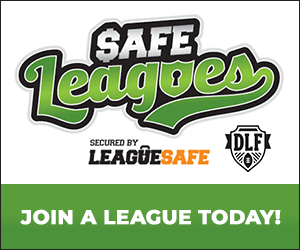 No other site interfaces individually with our members like DLF does, we’re committed to that regardless of how many thousands of members we have. We take a great amount of pride in that. We need our members choosing to call DLF home and support what we’re doing here! That dude is obviously a troll. Probably someone who signed up and took zero advice and didn’t win therefore he is unsatisfied. Im probably not understand,but those of us with current memberships aren’t locked in to the current price? Not unless you’re on the recurring plan and have never cancelled. Otherwise, check on Black Friday / Cyber Monday! This is fine. You guys do a lot, especially with the podcasts. What happened to Dynasty One? Just disappeared a couple years ago. I like the DLF one and Dynasty Blueprint, but that one was good too. Too many glitches, not enough rookie mocks, pretty poor rankings (can’t get over the continued Ronald Jones love) and the focus of the site in season is off. It’s a dynasty site, yet I don’t find anything useful during the season. It’s all information I can get for free elsewhere on seasonal sites. Sorry you aren’t happy with the product Matt. We always watch what the competition is doing and feel that, hands down, no other site has the depth or accuracy of our rankings. Each of our rankers independently ranks players and it’s always a balance between many variables. Often times, one of us may be much higher or lower on a player, including Ronald Jones. A young player always has upside. As much as he’s been a bust so far, it IS his rookie year and the situation still holds promise. We still feel there’s a lot of good dynasty information we provide during the season, but it is true there’s more depth and opportunity during the off-season. This price increase isn’t a money-grab in any way, it’s there to bring even more value to our product in the future on a number of fronts while keeping up with costs. Free sites can’t maintain the focus or commitment forever because it’s too much work. Hope you’ll continue to support us here and we always have opportunities to reduce the price point. Matt. You are absurd to the point I can disagree with every point you make. 1. Rojo- you know who else had a bad rookie season? I wish I was in your league. Literally 9 games in and your are aborting the mission. 2. Glitches?? It’s literally a website. You must be using Netscape or altavista. Call geek squad. 3. There is no other dynasty news site that offers the same info. Hand full of WordPress bs sites but no rational rankings with supporting evidence with an ever changing algorithm like them. MOST importantly it’s a great resource and more importantly it’s a SUPPLEMENT for you to make your own dynasty decisions. – Not sure what glitches you are referring to, I’ve never had any issues at all with the site. – Re: the rookie mocks. At one point I was going to tell the site, ‘enough’ with the rookie mocks. It was like one every week for a while. How many do you possibly need? – The rankings here are more complete, have more comments and info than any other dynasty rankings around. Seriously… what dynasty rankings are possibly better? You may disagree with a player or two here and there, you’ll do that with ANY set of rankings, but at least these have a number of different perspectives and are updated pretty frequently. – In season content is… in-season info. What else would it be? But it is still all done with a dynasty slant. 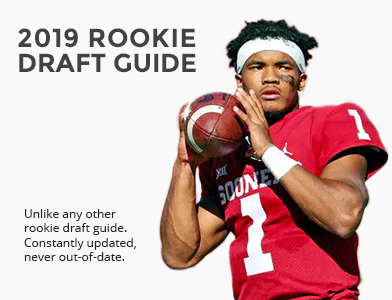 – ADP data, trade finder, dynasty player news, player profiles, comments, podcasts, devy info, draft guide… good god, it’s like I’m selling the product. Like mentioned elsewhere, dlf is not perfect, no site is, but it’s consistent quality year round entertainment and info. If you are serious about dynasty and devy, then dlf is a no-brainer even at $40 (no $50 like someone else said). Good bye, write me out. It was okay at 30, a rip off at 50. Toss me off your list. I will unsubscribe. Sorry to see you go Joel. We understand that many could feel that way. But, remember, as we said in this article, that if you think it’s “okay” at $30, we always provide opportunities throughout the year to reduce the cost from even that number. Our DraftKings promotion allows a new member to potentially join for what amounts to $10. Our Black Friday/Cyber Monday sales have always been less than $30 … so there’s no reason no reason to leave. But even if you choose not to support us via a premium membership, our community (forum) is still 100% free to participate in. You had me at hello!. It is what it is. It is a dynasty fantasy football site. There are no guarantees. It is information for you to process and make decisions to play the game. You can have your own feelings on rankings or weekly starters. But the quality analysis is here. The point is do you get the information to qualify the cost. As a premium subscriber for years, I can attest you do. if you are only in one or two dynasty leagues, and the championship payoff is only $50, then okay, it is a value assessment. But even with that, it is a hobby. And the daily reading of info on DLF is worth more entertainment than my daily newspaper subscription which cost more per year. Anyone not seeing the value is not truly into the dynasty football habit…..err.. love. To each his own, but you have my quan. Leo … thank you for your support and your words. Anyone who knows us here at DLF knows what we’re about and our commitment to our readers and members. I wish each of you could hear our conversations about how to bring the most value to our community while providing the best environment for all of you to play this great game and interact with us. It truly is a labor of love and it takes SO much time, most would be astounded. There’s a reason why so few sites actually maintain momentum and thrive for years. To be around since 2006 is very very rare because the work, dedication and commitment required to keep the lights on. Our wives are known as the “DLF Widows” for a reason. Our writers are the best in the industry and are the backbone and wheelhouse of who we are and what we do. If we could do this for the community and make it free, we would, it’s that simple. And again, we offer events like our Black Friday and Cyber Monday events to help our community get in at a lower price point because we know the money is not immaterial to many. We can’t thank our Premium members enough for being part of our community and supporting what we’re doing. Thank you Leo! Regardless of my thoughts on the price increase (hint: I get it), I am DEEPLY appreciative of how you keep us all informed. I don’t take for granted your transparency and your explanations, and also grateful of how early in the process you put this out there. Thank you. While people’s opinions about the price increase might vary, your consideration of your customers has always been top-notch, in my opinion. Thank you again!! Thanks Moishe … much appreciated. Price increases stink because making something more expensive means that less will take advantage of what we’re offering. So it’s truly the last thing we really want to do. Most don’t understand the amount of work/money it takes behind the scenes to keep a site like DLF running and we’ve always focused ONLY on dynasty so we don’t tap into the “games”, contests or DFS dollars that are flying around. We want to focus on dynasty for our members. One you expand into other areas, that focus has to broaden and that’s never good if you want to be the best at one thing. Appreciate your comment and your support! Will there be more IDP content? Our goal is to bolster all content offerings. IDP has been a tough nut to crack. It’s VERY different than the offensive skill positions so it’s always a work in progress to find the right amount of balance and commitment. I say this not to bash or “troll”. however,I’m finding it hard to justify spending even more money on a subscription. After recently discovering Twitter (I’m old) I have found a never ending supply of fantasy information that I can get for free. i have a couple of months before I have to renew, so I’ll Have to why the pros and cons. But that is why we announced this at the time we did with our Black Friday/Cyber Monday deal looming … to allow anyone to get a cheaper price point. We really do get the “free” information argument and our DLF wrtiers/owners make up a good % of those Twitter fantasy posters too. But free information is “free” for a reason. There’s no content schedule, consistent strategic focus or even a community of belongingness. DLF is more than just dynasty fantasy content. We’re a community focused on our favorite past-time with thousands of others wanting the same. If we aren’t supported financially, we can’t exist. That is why so many other fantasy sites start up and shut down … too much work, too much time, too much money. It can’t be sustained. Because of DFL, I now support other sites too because I understand that I need to support those that are putting effort to my favorite hobbies. That is why I’m never afraid to ask for support and why we operated with such a high value system including communication with our community. Our upcoming promotion will likely require less than $2/mo. to support your hobby and be a part of a great, thriving, and focused community. I hope you choose to stick with us! Great site and your 365 day/24/7 mantra is worth every penny. We support and understand the increase. Continue to develop top notch and creative writers and contributors! Thanks Slick. We very much appreciate your support and understanding! If you asked me what I paid in the past to subscribe, I wouldn’t be able to tell you. I just know it’s all valuable writing and research that helps me tremendously and I love this hobby. If the extra $10 breaks you (or whatever the bump is), this hobby probably isn’t for you. Thanks IF, we love to hear we have your support … and it’s great to see you on the lineup advice as well. That said, we do like to be a valuable resource that everyone can afford. We know there are some out there that simply can’t justify $30 for fantasy football subscriptions … let alone $40. But that is why we offer specials every now and then … to help those individual lessen their spend. At the same time, we wouldn’t be raising prices if we didn’t have to. It’s getting challenging to attract/keep writers and keep up with all the expenses with running a site like DLF. Of course, we’re hoping we have a loyal community that is willing to help us succeed … and quite frankly, I wouldn’t trade our community for anything.